Summertime is all about the popsicles and BBQs, but what do you eat when its cold and rainy outside? I always feel that cold, windy days call for comfort food, and nothing is better than a steaming hot bowl of noodle soup! 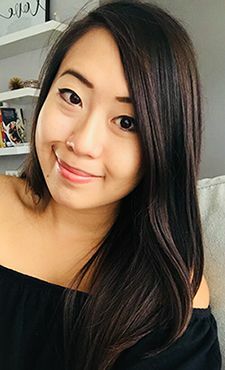 Ha Phuong's isn't new to the Edmonton dining scene, but it recently came to my attention after seeing a picture on my Instagram feed. I didn't think much of it, but my interest in visiting the restaurant was sparked again after reading this article about Chris Tom-Kee who is currently helping out at the restaurant. Later on I found out that the daughter of the owners recently took over the restaurant and is making some changes. One windy evening my boyfriend and I headed down to Chinatown to check the place out. When we first walked in we kind of thought to ourselves, "are we in the right place?" I felt a little uneasy as the restaurant was empty at 6:00PM on a weeknight and we had it all to ourselves. The lack of decor and old furnishings gave it that hole-in-the-wall feel, but we sat down and thought it could only go up from there. The restaurant doesn't supply you with menus, but there are two whiteboards hung on the walls with descriptions of dishes that are available. 7 items didn't seem like much to choose from, but we were excited to try out the offerings. To start off we ordered two Tomkee's Twists ($1.50), which are a spin on the traditional green onion cake. 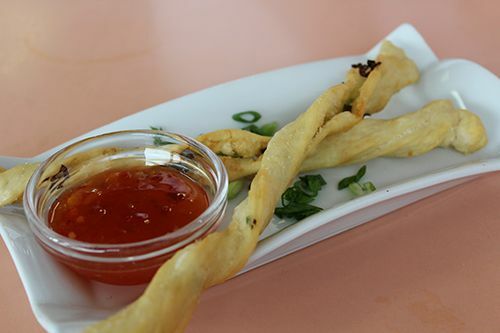 Twisted out into a long stick, the green onion cake twists were crispy, fluffy and fragrant. The sweet chili sauce served on the side added some flavour, but I honestly ate these by themselves and probably could have ordered a couple more. Hu tieu is a hugely popular noodle soup in Southern Vietnam. The broth is typically made from pork bones, but some variations have seafood as well. Ha Phuong's offers regular hu tieu and also Hu Tieu Kho ($10), which is a version I've never had before. 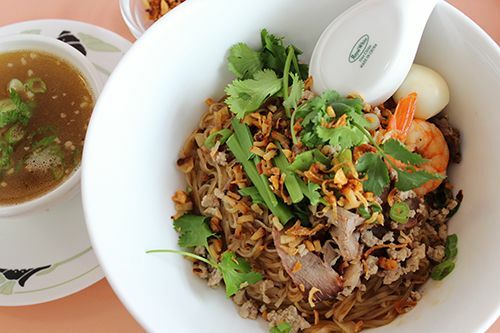 Basically, rice noodles are tossed in a special house made sauce, topped with meat, fried onions, and served with the pork and seafood based broth on the side. This dish was excellent! Al dente noodles were tossed in a fragrant hoisin based sauce and the broth had a really nice depth of flavour. BBQ pork, Vietnamese pork sausage and another cut of pork topped the noodles along with shrimp and a quail egg. I would highly recommend trying this dish out! It just so happened that on the night we visited the restaurant was offering bun bo hue as an off menu special for $10. 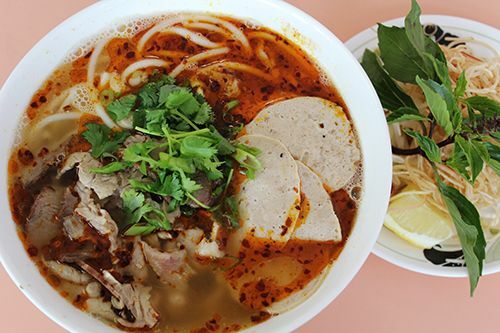 Bun bo hue is a popular spicy noodle soup from Central Vietnam and happens to be one of my favourite noodle soups. The spicy soup is so perfect for warming up on cold days! The version served at Ha Phuong's was delicious. The broth had a really nice depth of flavour with strong notes of lemongrass (which I love). The soup wasn't too spicy and there was a good portion of meat and noodles. I feel like there aren't too many people that know about Ha Phuong's and the great noodle dishes they're cooking in the kitchen. I'll definitely be returning on another cold day for a hot bowl of soup! Stop by if you're in the area, I know you won't be disappointed. It is no secret that I love jackets. Of all the jackets and cardigans that I have in my closet, I love my leather jackets the most. If I won the lottery, one of the first things I'd buy is a brand new leather jacket. 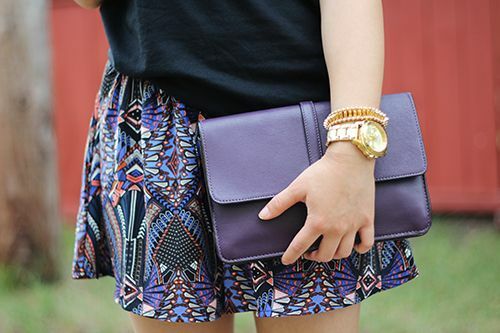 I love the way they add some edge to an outfit and their ability to transition from night to day. They last forever, keep you warm, and are available in a wide variety of colours. Why wouldn't you want one? Just recently I was introduced to the leather jackets by Andrew Marc, a designer based out of New York. Andrew Marc is well known for their leatherware, with jackets prized for attention to detail and asymmetrical zippers on leathers in bold colours. 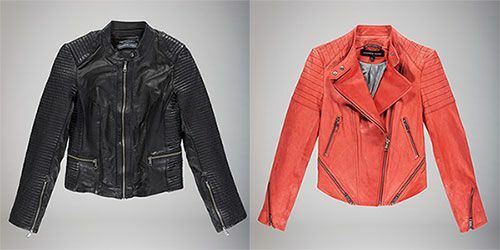 Browsing through the website, I fell in love with two of the jackets from the women's spring collection. The placement of the zippers and stitching really make these two jackets stand out for me. Best of all, they're even on sale right now! It's taking a lot of willpower not to buy them both, but they'll be sitting on my wishlist for the time being. But maybe you'll buy one? Do any of you own any jackets by Andrew Marc? Let me know! After the opening of Mama Lee's Kitchen in the south side I was surprised to hear that another Korean restaurant was opening up in the same strip mall. I'm not the biggest fan of Korean style Chinese food but figured it was worth checking out since it is so close to where I live. A bunch of us food bloggers decided to get together and check this restaurant out on a Thursday night. The restaurant doesn't take reservations so arriving at 6pm allowed us to get seated at a large enough table for us all. That fateful night was one of the hottest in Edmonton so far for the summer and lucky for us the restaurant has no air conditioning. The combination of the outside temperature, number of people seated inside and the heat coming from the kitchen made it crazy hot in that small little restaurant. In most Asian cuisines, dishes are served family style so you're able to have a little bit of everything. We were disappointed to find out that none of the cold seasonal dishes were available, especially given how hot it was in the restaurant! But we decided to start with Jab Chae (#19, $20) which is one of my favourite Korean dishes. 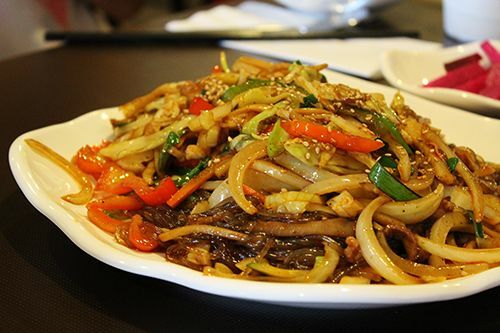 The dish is comprised of chewy sweet potato noodles stir fried with a variety of vegetables and pork. I really enjoyed the version at Rae Mi Hyang as there was plenty of fragrant sesame oil for flavouring which also prevented the noodles from sticking to one another. There was a generous portion of vegetables, everything was seasoned well, and it even had a kick of heat! 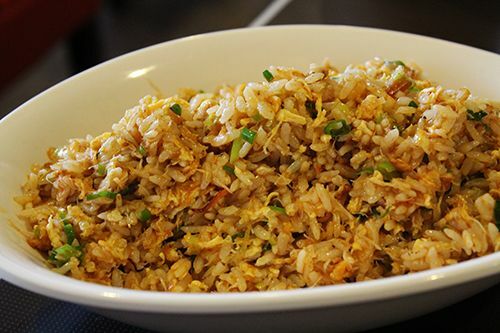 Next up was a crab meat fried rice with XO sauce (#46, $15) which came piping hot to the table. There was a good amount of real crab meat in the rice, some vegetables, and fried egg. A bit of heat came from the XO sauce, but otherwise I found the dish to be quite ordinary. With a thin, deep fried coating and a smothering in sweet chili sauce, Korean fried chicken seems to be all the rage these days. The Kan Fung Gi (#25, $23) at Rae Mi Hyang is described as deep fried chicken with a spicy and sour sauce. 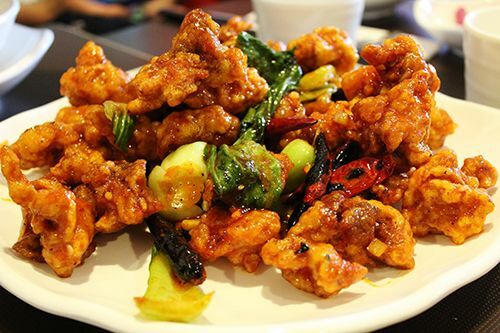 A huge plate of deep fried chicken strips arrived at the table coated in a sweet and very spicy sauce. I'm not a huge fan of sweet & spicy so I was a little disappointed when the dish arrived different from the description on the menu. Everyone else seemed to enjoy the dish though, working hard to eat through the heat of the chilis. 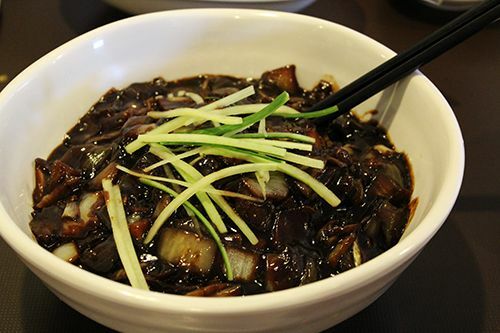 Next up were our noodle dishes, and the first to arrive was the Jajang Myun (#37 - family size, $18). 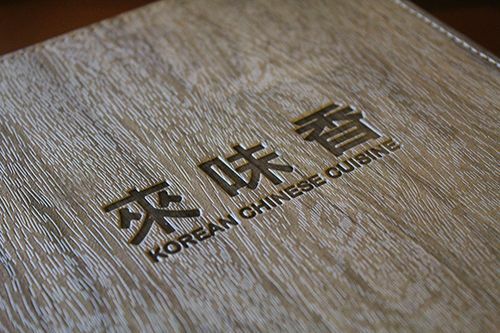 This dish is very popular in Korean Chinese restaurants as it is a dish that originated out of China. A thick sauce is made out of salty black soybeans and Rae Mi Hyang has the flavour spot on. It has a perfect balance between sweet and savoury, and the sauce isn't overly thick. The wheat noodles resting below the sauce were al dente with a slightly chewy texture, and there was a good portion of onions, cucumbers and radish to accompany the dish. Last but not least came the Jjam Bong, and we ordered the spicier version (#38, $14). 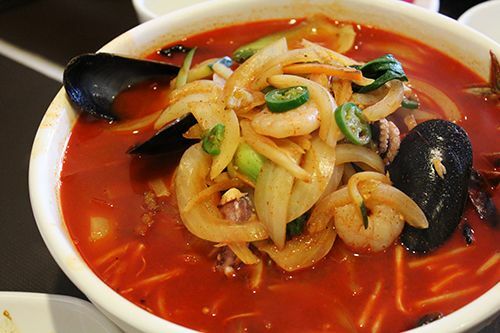 Jjam bong is a popular korean dish that is basically spicy seafood noodle soup. We may be crazy for ordering a hot noodle soup on a hot day, but jjam bong is a dish that I love and I wanted to try out Rae Mi Hyang's offering. A big bowl of noodles came out to the table, topped with some jalapenos to give additional heat. The broth itself was quite spicy and peppery with some garlicky notes in there as well. Mussels, shrimp and squid sat atop of the dish, and some digging around revealed half of a small crab in the bowl as well. Surprise! Had I known how spicy their dishes would be, I probably would have gone for the mild version, but the noodles were cooked well and all around it was a solid dish. 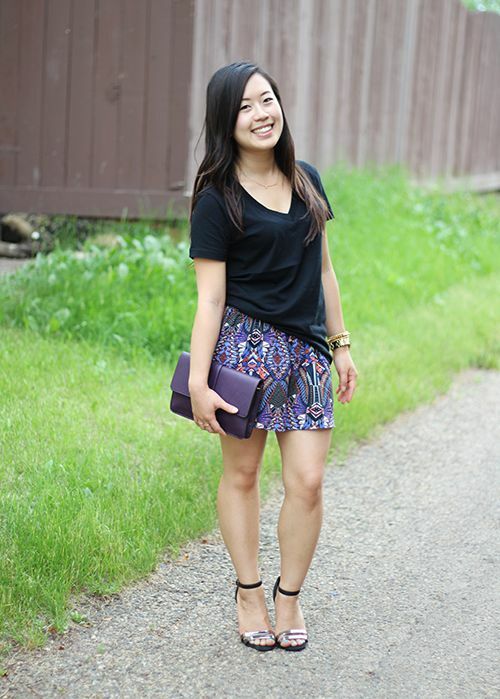 Rae Mi Hyang is a cute little Korean Restaurant situated in the south side of Edmonton. 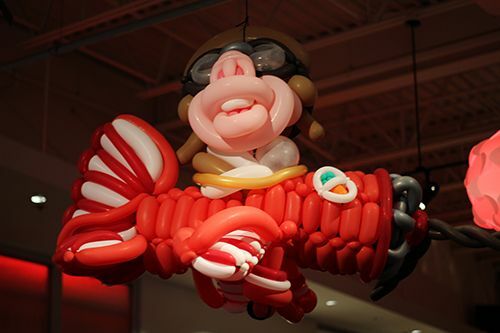 It offers up something different from Mama Lee's Kitchen three doors down and the service is quick and friendly. I did feel that some the dishes tended to be more on the expensive side compared to their counterparts at other Korean restaurants, so I hope that extra profit is going towards installing some air conditioning in the restaurant! I enjoyed the noodle dishes and would return for the jjam bong when the weather cools down and I'm craving some Asian comfort food. Check them out and let me know what you think! As the days go by, scorching summer temperatures are returning to my city. 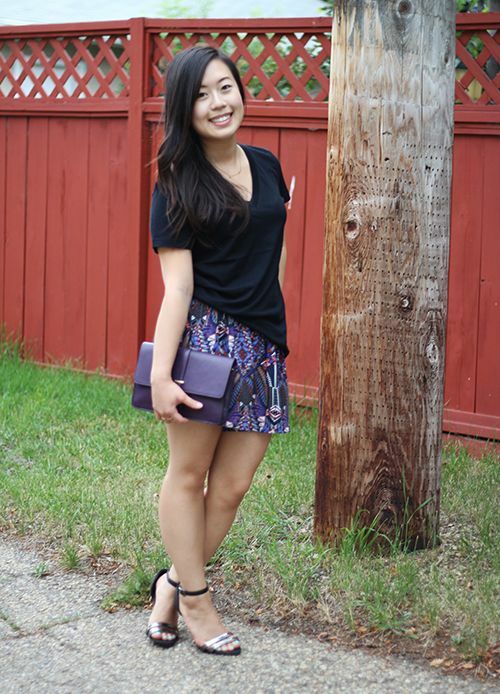 I've been finding myself attracted to abstract prints, which lead me to purchasing these fun shorts! I'm also really loving slouchy tees since I can eat all the ice cream I want without anyone knowing, and the loose fabric helps with keeping me cool. Dual functionality, people. I love it. 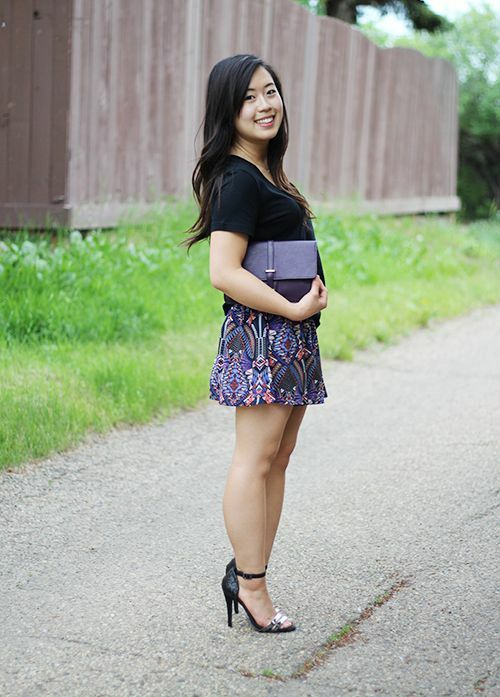 What are you currently loving in your summer wardrobe? Bacon makes the world go round. For some people anyway. Over the past couple years bacon has made big strides in the food scene and continues to be a featured ingredient on menus around the world. 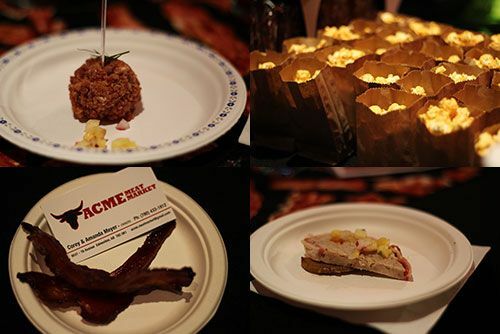 It was about time Edmonton had a festival of its own to bring bacon lovers together, and it finally happened last Friday! 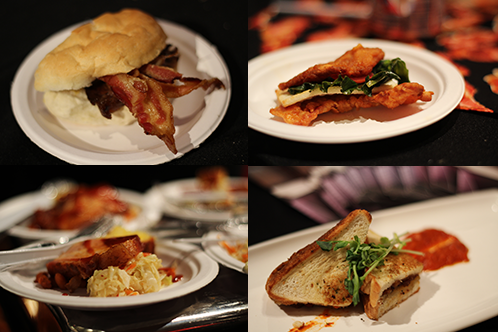 Hosted by Jiffy Lube, 10 different restaurants/vendors came together to make bacon-inspired dishes for attendees. 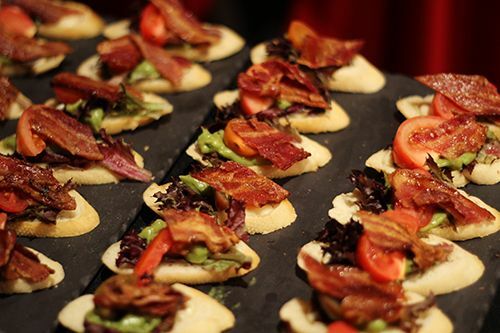 There were numerous different takes on the classic BLT, traditional bacon slices, and bacon-laden desserts too. 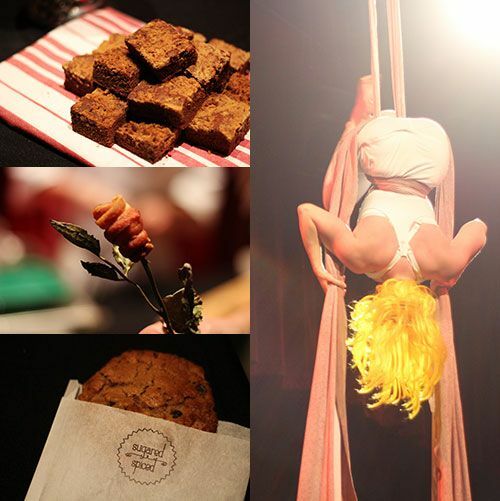 Top it all off with some fun giveaways and a "bacon and egg" inspired aerial performance and it ended up being a pretty fun night. There were definitely hits and misses to the dishes, but I don't blame the vendors for having little prep room on site to keep everything fresh. Sending out a huge thanks to the organizers for inviting me down to check everything out! Perhaps I'll see you down at the festival next year if you missed it this time around :). It's been a busy week for me but that hasn't stopped me from venturing out for an Italian fix! I have heard a lot of great things about a new Italian market here in Edmonton and finally had some time to check it out with a friend. 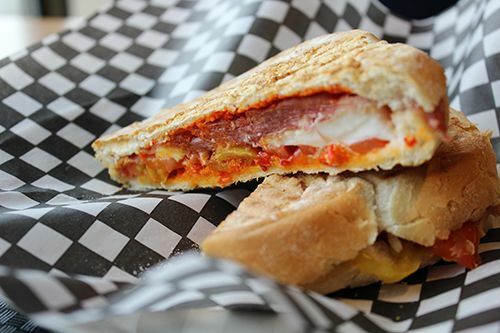 D'Amores Mercato opened up in the south side of Edmonton in February of this year. I expected the space to be pretty big considering all that it offers, but the market and bistro are both in a small 100 sq. foot space. When I walked through the door the bistro side immediately caught my attention with the wood burning oven in plain sight. It was about 12:30 last Wednesday when we arrived and it seemed like we just missed the lunch rush. 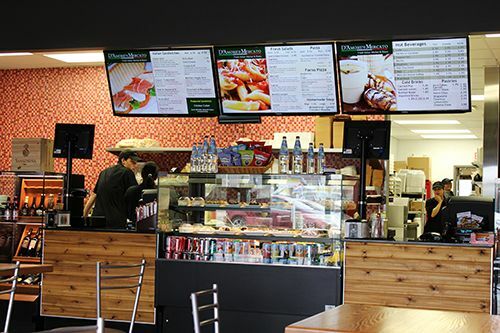 We walked up to the front counter to see the menu displayed on three different screens and found a wide range of offerings ranging from salads to sandwiches to pizzas and pasta. It was difficult to pick, but we settled on sharing a sandwich and pizza since we also got tempted by the pastries in the display case. Our Prosciutto & Bocconcini Sandwich ($6.50 medium size) was up first, available on white or whole wheat. Grilled up on a panini press, this sandwich came out hot with melted gooey bocconcini. The sandwich didn't skimp out on the prosciutto, as the multiple thin layers stacked together to give the sandwich some substance. The addition of pickled peppers and veggie spread gave the sandwich a tangy kick and the light crunchy bread held everything together. Their menu boasts a wide variety of sandwiches, and if they're all as good as this one I'll need to come back and try them all out! 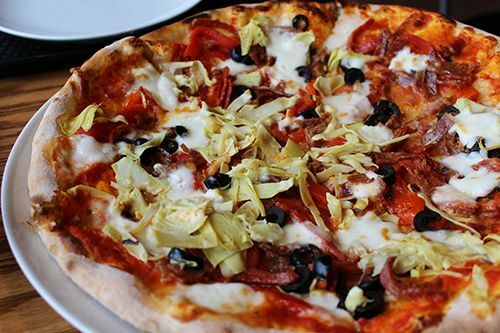 We ordered the Mercato Pizza ($12.95), which is topped with artichoke hearts, hot soppressata, peppers and mozzarella. This pizza looked pretty impressive when it arrived at the table. The light, thin crust was perfectly cooked without any charred bits and had an abundance of toppings scattered overtop. It was larger than I had expected for the price and the flavour was bang on. 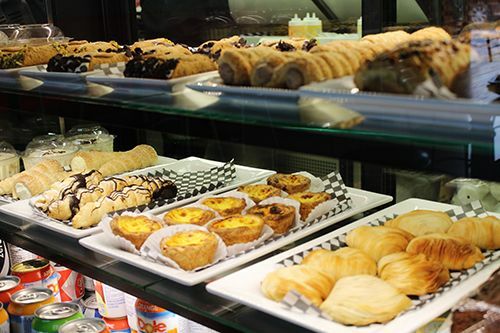 Out of all the pastries and desserts in the display case the sfogliatelle was the most interesting. I've never actually had one in the past so it was exciting to see that D'Amores Mercato makes them from scratch in house. 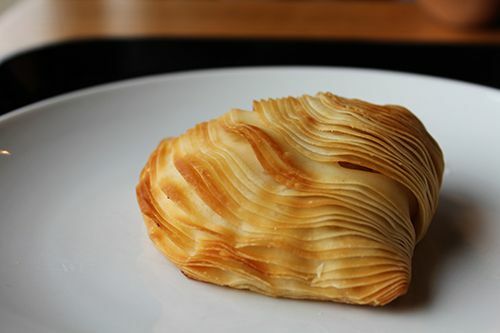 This particular pastry is shell shaped and made of many thin layers of dough and butter, giving it the distinctive layered appearance. It takes quite a lot of skill and patience to make sfogliatelle so it's definitely nice to have a place to purchase them from. I took a bite of the cold pastry and instantly knew it would be much better served warm. Bringing it home and toasting it up in the oven made the pastry golden brown and crispy and warmed up the lemon ricotta mixture inside. It was a little on the oily side, but the filling was fragrant and the creaminess worked well with the pastry. 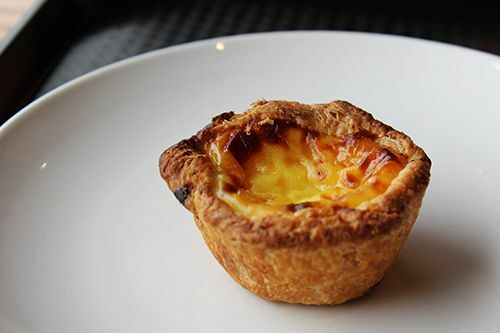 A pastry that I absolutely love is Portuguese egg tarts. Everytime I'm in Macau I pick up a ton and just binge on them 'cause they're absolutely amazing when they come hot out of the oven. D'Amores Mercato also offered one and unfortunately this couldn't compare to the real deal. The pastry shell was quite dense and not crisp and flaky the way it should be. The custard in the middle was also too sweet for my liking, so I would stay away from this one. D'Amores Mercato is a great addition to Edmonton. The bistro side served up delicious food and I definitely would return again to try out some other offerings. I'm looking forward to trying out the fresh pastas made in house and I've heard great things about the tiramisu. On the market side there is a deli with a wide variety of cured meats, but what caught my eye was the freezer section. Many of the dishes served on the bistro side are packaged up into different sized portions for you to take home and enjoy! How great is that? They also support Edmonton's Pinnochio Ice Cream by carrying an array of flavours in the freezer. 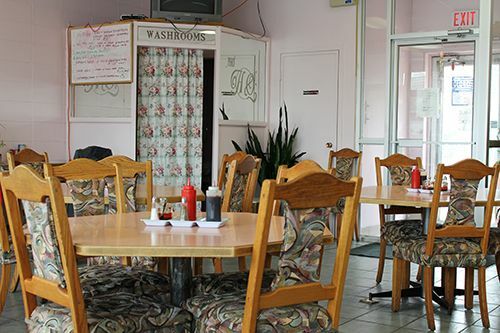 The small space has quite a lot to offer, so if you have the chance definitely stop by for a bite! Orders come out quickly and you can be in and out of there in no time.